UNITED NATIONS, October 17 -- While a draft resolution on Yemen seems more likely to pass the UN Security Council than the double-vetoed proposal about Syria, the reason may be that the Yemen proposal not only is supported by the United States, but implicitly accepts immunity for the leader, Ali Abdullah Saleh. Operative Paragraph 5 of the Yemen draft, as seen by Inner City Press, calls on the parties in Yemen to move forward and implement a transition "on the basis" of the Gulf Cooperation Council initiative. 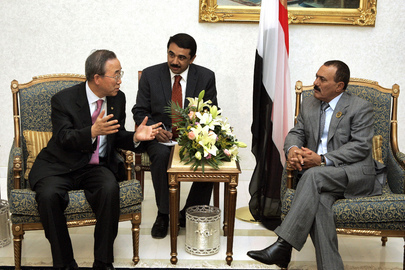 This GCC initiative involves immunity for Saleh, not only at the International Criminal Court in The Hague, but even immunity from prosecution in Yemen itself. Well placed sources tell Inner City Press that the US was largely responsible for the GCC plan, and "now urges the Security Council to endorse its plan in a resolution the UK's drafted," as source source put it, continuing that "Obama wants to see his call for Saleh to leave carried out, despite the remaining support and military force Saleh has in the country. The only way is to offer immunity, and hope few notice or complain." The problem is that one of the major demands of the non-violent protesters in the streets of Yemen is to bring Saleh to court. Some assumed that opposition groups in Syria would have applauded a Security Council resolution, even if as "watered down" as US Ambassador Rice described it no sanctions were imposed or even directly threatened on Bashar Assad. But in Yemen opposition groups might speak out against a Security Council resolution endorsing the "immunity plan," as it is called. And the new Nobel Peace Prize winner from Yemen Tawakkul Karman might also denouncing, using new found prominence, such an embrace of immunity for Saleh. The proponents of the resolution, a new draft of which is slated to be circulated, try to blunt this criticism by saying that "the accountability language is in." But it is a mere reference to the word accountability, in the context of referring to the human rights process in Geneva, A/HRC/18/21. Even on that, the draft drops the call from an "international" investigation, shifting back to independent and impartial. Impartial indeed. Wath this site.